The NHL playoffs have shown that two goaltending philosophies bring success. Some teams have won with a star netminder, while others have used depth to advance. The Sabres have neither option available. Buffalo entered its offseason with the shakiest goaltending situation in the league. Chad Johnson is the only goalie under contract with measurable NHL experience, and the 28-year-old is a career backup with 56 appearances. Andrey Makarov, 22, played his one and only game with a week to go in the season. Obviously, the Sabres are going to need help in the crease. They could try their luck with a thin free-agent class, or they could seek trade options with organizations that boast up-and-coming goalies. Minnesota’s Devan Dubnyk is the top free agent. The Vezina Trophy finalist will get a big raise from his one-year, $800,000 contract, but the Wild may push to re-sign him before July 1. The sides don’t plan to discuss a contract until after the playoffs. Other unrestricted free agents include former Sabres Jhonas Enroth and Michal Neuvirth, San Jose’s Antti Niemi, Calgary’s Karri Ramo and Edmonton’s Viktor Fasth. Buffalo could also elect to re-sign pending UFA Anders Lindback. 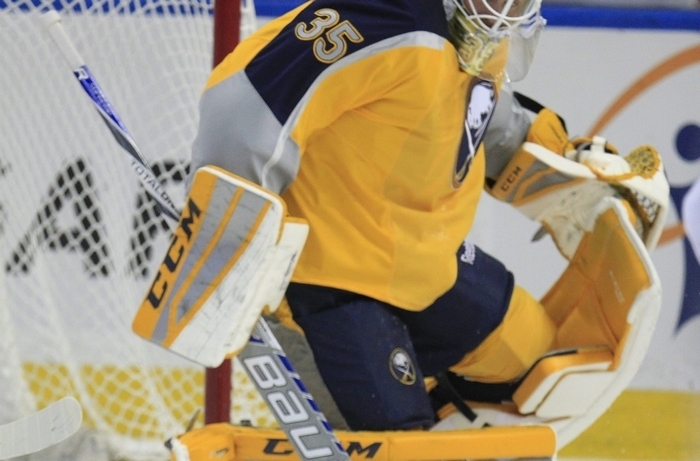 Lindback, who turns 27 on Sunday, turned his career around after being acquired by the Sabres in February. He had a .924 save percentage during 16 appearances, going 4-8-2 with a 2.76 goals-against average. “It’s all about giving the team a chance, and I think I did most games,” Lindback said on locker cleanout day this month. “I proved to myself and to everybody that I can play in this league, but I still think there’s room for improvement. I think I can get better, and I think I will. Lindback has completed the one-year, $925,000 deal he signed with Dallas. He is interested in returning to the Sabres, but there have been no contract discussions yet. If Sabres General Manager Tim Murray isn’t enamored with the free agents, six teams could have goalies available via trade thanks to an overabundance of netminders. The most established is Detroit’s Jimmy Howard, who has become a playoff bystander because of the emergence of Petr Mrazek. Howard, 31, has four years left on a contract that pays $5.3 million per season. It includes a no-trade clause. The New York Rangers’ Cam Talbot put himself on teams’ radar by excelling while Henrik Lundqvist was injured. The 27-year-old went 21-9-4 with a .926 save percentage and 2.21 GAA. Talbot, who will make $1.45 million next season, will become a UFA in 2016. The Rangers, who also have Mackenzie Skapski in their system, would want a lot, but the Sabres have a second first-round pick they could use in any deal. Other promising young goaltenders trapped behind established starters include Los Angeles’ Martin Jones, Colorado’s Calvin Pickard, Nashville’s Marek Mazanec and Ottawa’s Robin Lehner. Johnson wants to prove he can become a reliable part of any tandem. Acquired by the Sabres in March, Johnson didn’t play in any games for Buffalo after spraining an ankle on the morning of his scheduled debut. Johnson is 28-14-7 with a .914 save percentage and 2.41 GAA during stints with the Rangers, Arizona, Boston and the Islanders. He went 17-4-3 with a .925 save percentage as the Bruins’ backup in 2013-14, but he was just 8-8-1 with an .889 save percentage for the Islanders this season. He has one year left on a contract that pays $1.3 million annually.